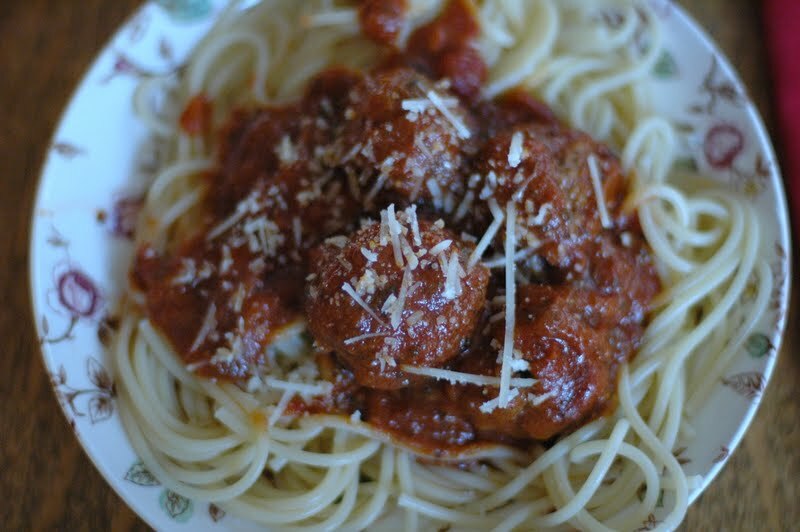 Why do we love Spaghetti and Meatballs? They seem to be universally adored (unless of course you’re a vegetarian)! I mean, my father in-law loves when we make this dish and my 3 year old daughter loves it as well. 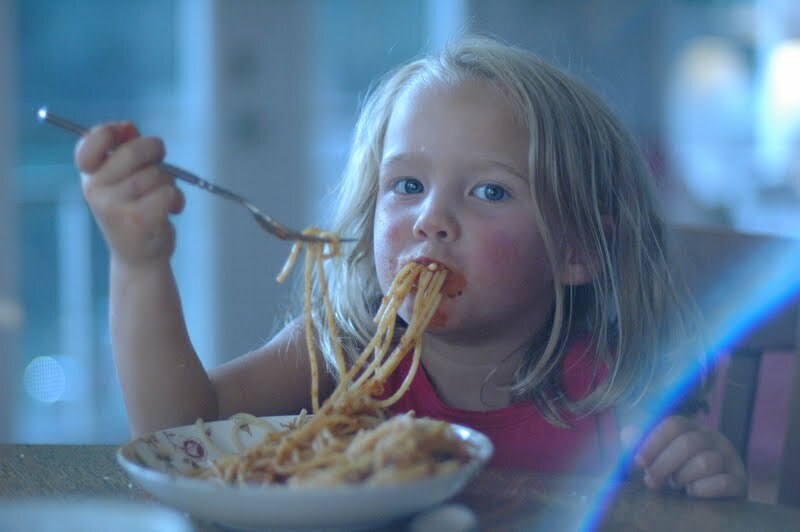 Is it the “On Top of Spaghetti” song that eating a big bowl of it inspires us to sing? 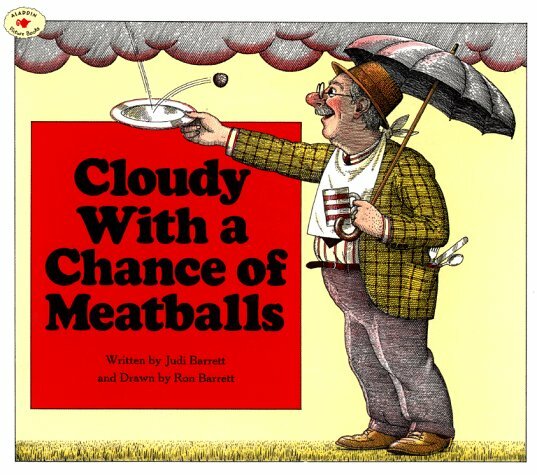 Or is it the fun images of the classic children’s book (recently made into movie), Cloudy With a Chance of Meatballs, that makes it iconic somehow? Or is it because you can make little bitty meatballs or GREAT BIG HUGE meatballs? It is a comfort food indeed. There is just something so tasty and fun about this meal and it’s so easy to throw together. 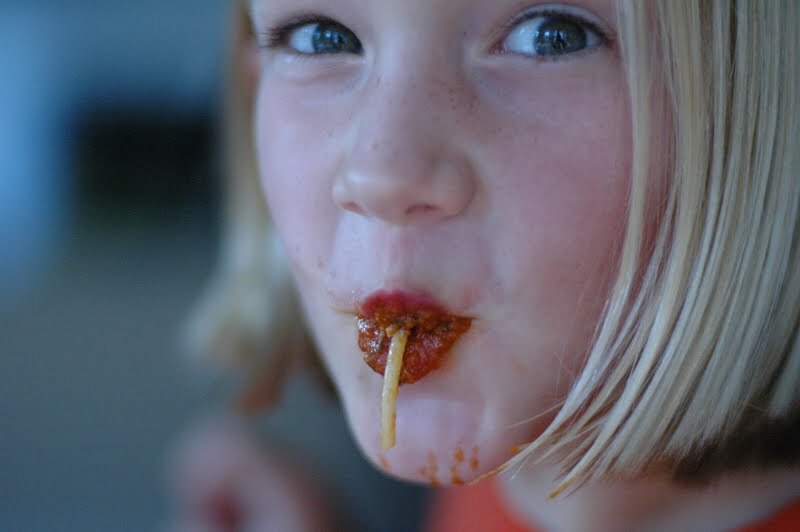 I started making spaghetti and meatballs years ago when my son was a toddler and didn’t like meat sauce with pasta, but yet we wanted to add some kind of meat to the meal. [I think meat sauce is unappealing to some people – something about the texture of the ground beef throughout the sauce.] So, in order to ramp up the noodles-and-red-sauce dinner, and to give us some protein, I tried making some meatballs. I made turkey meatballs with a recipe from an Everyday Food magazine. They were simple, fairly healthy and they were a hit! We all loved them. A few years later, the Everyday Food magazine published another meatball recipe, this one with beef called “easiest meatballs”. Both recipes are winners although the beef has less steps. I have combined the two recipes into one, simple, tasty meatball recipe that can be done with ground turkey or beef. They can be made on the spot or ahead of time. They also freeze well in a ziplock bag. It’s a winner. In a large non-stick skillet, heat olive oil over medium heat. Saute garlic until golden, 1 minute or so. Add tomatoes, oregano, thyme. Add salt and pepper to taste. Let simmer for 10 minutes. Make the meatballs: In a large bowl, whisk together egg, 1 teaspoon salt, and 1/4 teaspoon pepper with a fork. Stir in garlic, breadcrumbs, cheese, and parsley. 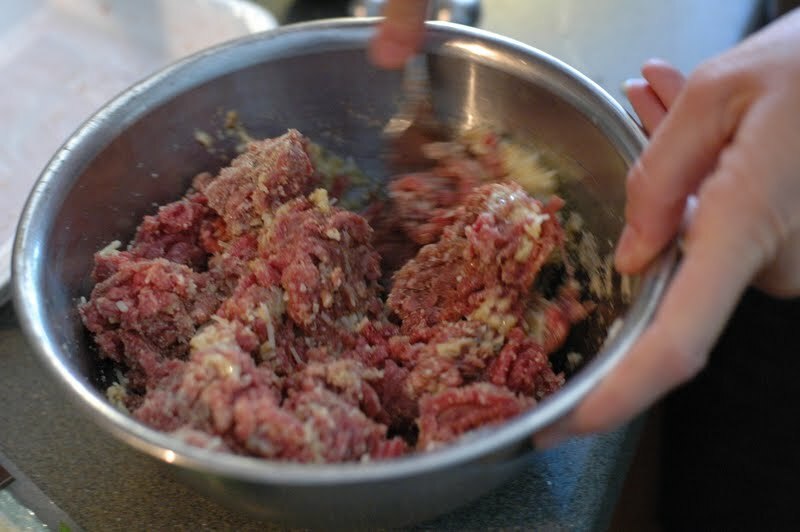 Add ground meat and mix until combined. If you made the homemade sauce, add the meatballs to the skillet, covering them with sauce. 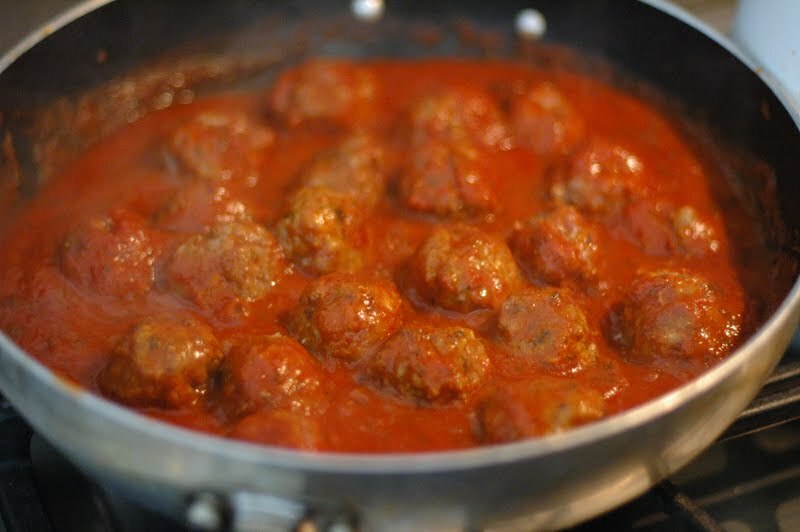 If you opened a jar of lovely bought sauce, place the meatballs in a large non-stick skillet, over medium heat. Cover with sauce. Bring to a boil, lower heat, and simmer, gently turning after 10 minutes. Cook until meat is cooked all the way through. Meanwhile, bowl a pot of water and cook spaghetti until al dente (according to package instructions), about 12 minutes. Drain pasta, serve, top with meatballs and sauce. Serve with more cheese sprinkled on top…of spaghetti…. (sing it with me)! 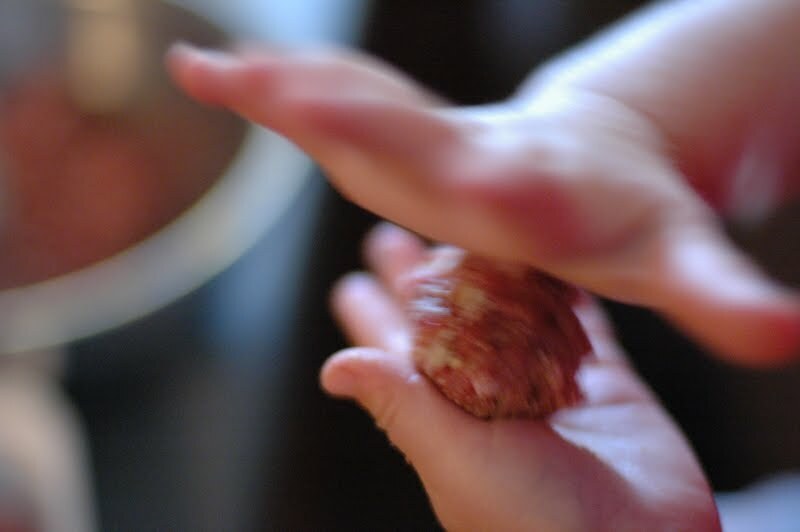 ***There are many ways to cook the meatballs. Some recipes call for baking them on a baking sheet in the oven, some call for browning them in olive oil in the skillet on stove top. I think because this recipe uses lean meat, it works well to cook them in the sauce, as Martha recommended in the original recipe. There is not much excess grease and cooking them in the sauce keeps them moist and tender, not dried out and tough. We had a nice tutorial with our children about using a large spoon to help eat spaghetti the other night. We showed them how to use a spoon as leverage to twirl noodles onto a fork. However, it wasn’t the most effective lesson- as evidenced here! My mouth is watering!! Putting this on my menu for the weekend! YUM! Gorgeous girls by the way! My go-to meatball recipe is from Everyday Foods, too! It sounds pretty darn similar to your hybrid, so I am almost absolutely sure we used one of the same ones. In fact, the other day we thawed some out and made yummy meatball subs for dinner. 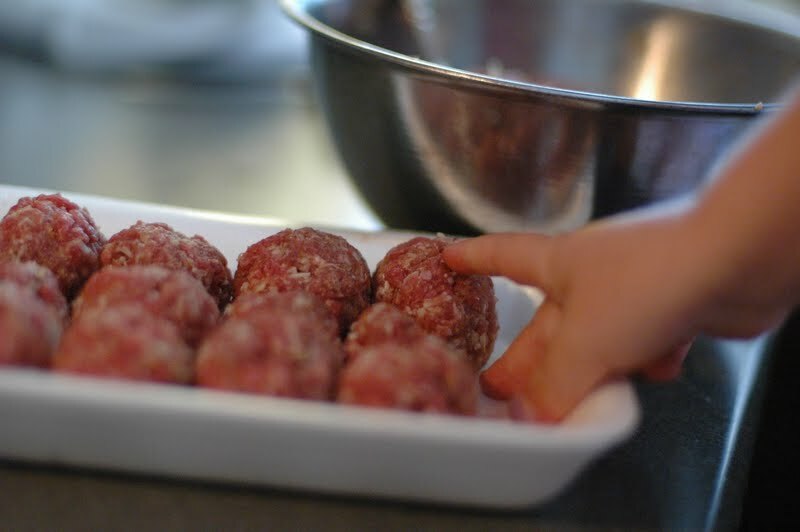 We love to make lots and freeze them, and I am remembering that I made meatballs for little E when I was introducing meat to him as a baby. The original turkey meatball recipe I used had chopped white onion in it. It was more work AND was a little more “adult” – no matter how finely I chopped the onions, my kids disliked the chunky bits of onion. How does your recipe compare to mine? I love that though miles apart, you and I are drawn to the same foods at our tables! xo!